There are many myths about signing with a college as a sophomore. LESS THAN 3% OF YOUTH SOCCER PLAYERS RECEIVE A COLLEGE SOCCER SCHOLARSHIP, AND MOST ONLY GET A PARTIAL AMOUNT. 82% OF ALL COLLEGIATE PROGRAMS ARE OUTSIDE OF NCAA DIVISION I (DII , DIII , NAIA, NJCAA). COLLEGE COACHES ARE NOT INTERESTED IN YOUR TEAMS RECORD, GOTSOCCER POINTS, OR HISTORY. THEY FOCUS ON IF YOU CAN PLAY FOR THEM, IF YOU ARE A GOOD STUDENT, AND WILL ENRICH THE COLLEGE ENVIRONMENT. COLLEGE COACHES DO NOT NORMALLY ATTEND HIGH SCHOOL GAMES. THEY FOCUS ON SHOWCASE TOURNAMENTS DESIGNED TO SHOWCASE LARGE NUMBERS OF PLAYERS SEPARATED BY AGE AND TALENT LEVEL. 98% OF ALL CONTACT BETWEEN COACH AND PLAYER IS INITIATED BY THE PLAYER. UNLESS YOUR SON OR DAUGHTER IS IN THE US NATIONAL TEAM POOL, SHE WILL NEED TO CONTACT THE SCHOOLS HE/SHE IS INTERESTED IN. THERE ARE SEVERAL WAYS FOR YOUR SON OR DAUGHTER TO BE SEEN BY A SPECIFIC COACH: COLLEGE SHOWCASE TOURNAMENTS, COLLEGE ID CAMPS, SUMMER CAMPS, LEAGUE GAMES, & ODP/ID2/US NATIONAL TRAINING CENTERS. GOOD GRADES AND TEST SCORES ARE FAR MORE IMPORTANT. THERE IS MUCH MORE ACADEMIC AND NEED-BASED SCHOLARSHIP MONEY THAN ATHLETIC MONEY. NCAA DIVISION I PROGRAMS ARE NOT ALL THE SAME. THERE ARE MANY DII, DIII, AND NAIA PROGRAMS THAT ARE BETTER FUNDED, HAVE BETTER TEAMS, AND PROVIDE A BETTER EXPERIENCE FOR STUDENT-ATHLETES. 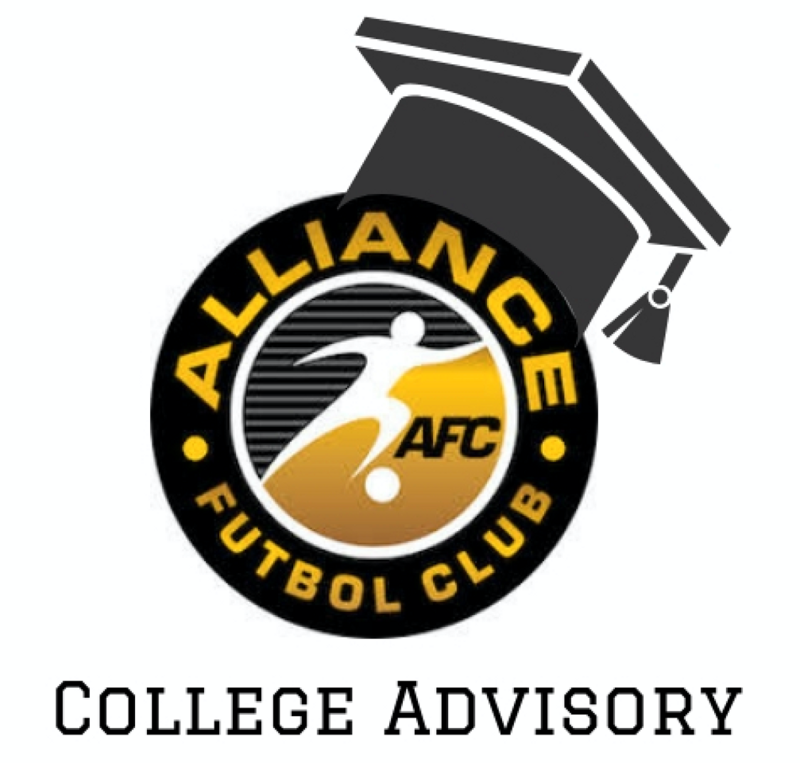 Alliance FC will provide you with guidance through the process. There will be a step by step process to show you how to search, choose, and contact colleges schools. Alliance FC players registered will have one year subscription to Hudl and will have access to be recorded with a hi-pod camera to send video to college coaches.